Last week we got an email from Sweden. The author, a fancier of Anubias plants, told us about his problems concerning the so called “Anubias rotting”. We publish the email of our reader and try to understand what can cause this disease. While looking for information on Anubias plants I found the Bulletin of the Russian Anubias Forum (http://anubias-engl.blogspot.com/). As an aquarist, for the last decades my main interest have been African fishes, and I am now running a 2 meter wide paludarium devoted to animals and plants from Africa. Anubias has long been my favorite plants and they do very well in a paludarium. However, we are a few local aquarists that have experienced a common fatal problem with our Anubias recently. As you seem to be experts in this area I hope you don't mind me asking you a question about this. I recently had an issue with several Anubias plants I bought at a local pet store and planted submersed. They looked perfect. However a week or so after introducing them to my tank I started to find Anubias leaves floating on the surface. 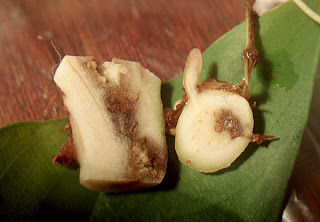 The leaves still looked fine, but the stems seemed rotten at the base where they attach to the rhizome. Every day I found several new loose leaves, and eventually the whole rhizome went soft and 'rotten' and the plant died. I had a few Anubias in the tank already and they were also affected, even though I had had them for years before without problem. Do you have any idea what this could be and how it could be avoided? Is it a disease? Is an environmental factor, bad water quality or such, or maybe the environmental change when buying new plants? We would be very grateful if you could shed some light on this. By the way, the story about the 'Frazier'-Anubias was very interesting! It is for the last few years that a ghost of Cryptocoryne disease has been wandering among Anubias plants fanciers. Almost every aquarist has come across the problem of the plants death soon after they have been purchased. Although it was only 15 years ago when the plants were compared with plastic models and thought to be of an ideal health. What may cause such a severe attack of disease? Though I don’t have any definite answer, I will readily share the guessworks and facts I’ve learnt with the reader. To start with, I’d mention that I’ve already have to face several types of Anubias plants disease by my experience. 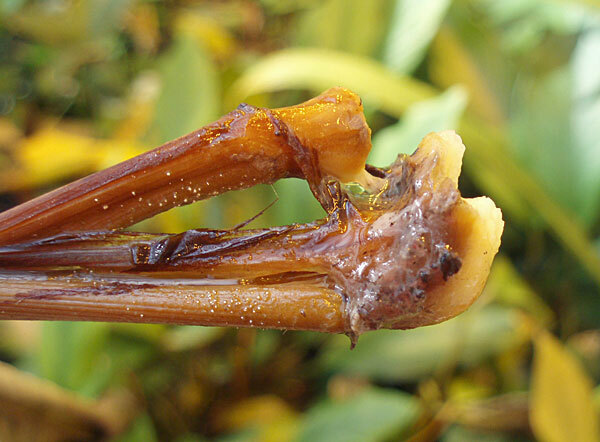 The first type can be recognized when rhizome and leafstalk tissues become glassy quickly and die off within 2-3 days. As a rule, the disease is preceded by some abrupt changes of the plant conditions, such as delivering, replanting, undercooling or overheating. All this can be fully applied to Cryptocoryne plants. The only difference here is that the disease affects leaf tips tissues instead of rhizome ones. The rot of tissues may start due to poisoning with ammonia which is released during the plant respiration. Sometimes it results in a complete die-off. Yet I cannot say definitely whether it is caused simply by changing the plant conditions. Thinking about the cause, I recall an incident when several dozens of A. afzelii bushes were completely burnt by hot water due to a break in a water pipeline. The plants lost all their leaves, but soon recovered completely as their rhizomes survived. The entire state of the initial material may be of great importance. The better conditions Anubias plants have been grown in, the more tolerant they are to different factors. Some aquarists blame misfortune on the hothouse conditions which the sold plants have been grown in. Yet it is utterly wrong. I’ve been growing Anubias plants out of water for many years and have never faced any problems. While being transferred into a tank they have never lost a single leaf! The first difficulties have appeared after getting the plants from large hatcheries where they have been grown hydroponically. It is still a puzzle for me why the plants which have undergone the process of meristem cloning (including tissue defertilization) are affected by diseases so often. It may be caused by some growth-promoting factors applied during the plants growing. Anyway the cause has nothing to do with inorganic nutrition of the plants, since I’ve already experienced that Anubias plants grown in a hothouse and fertilized with the solution strength of 3-4 gram per liter can easily establish in the conditions of a usual aquarium. The second type of disease is called a “rhizome rot” in Russia. It is a slower ailment which can develop within years and is characterized by a spread to rhizome vessels (black spots are usually seen on a section plane). It is also a contagious disease, but its nature is not clarified completely yet, thus it can be either bacterial or fungal. It is possible that a fungal infection simply joins in the process after the rot of tissues has begun. The initial cause, however, is absolutely different. 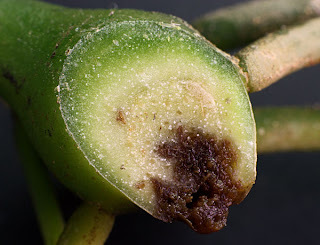 Italian colleges point out that similar types of rot can result from Rhizoctonia solani fungi. 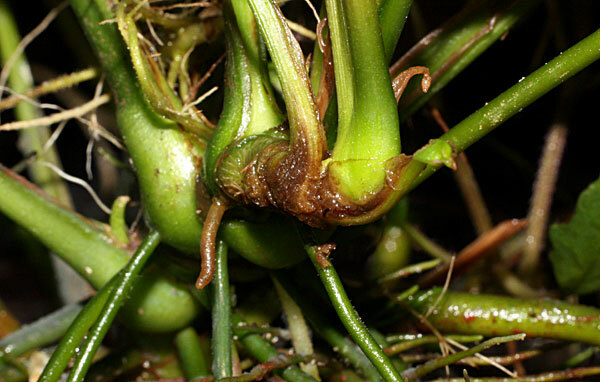 When root caps or calyptras of the plant get affected, the disease spreads further to the rhizome. Thus it is primarily important to pay attention to the root system of newly purchased Anubias plants and check it to be ideally healthy. The absence or scarcity of roots should be a sign of warning for a buyer. 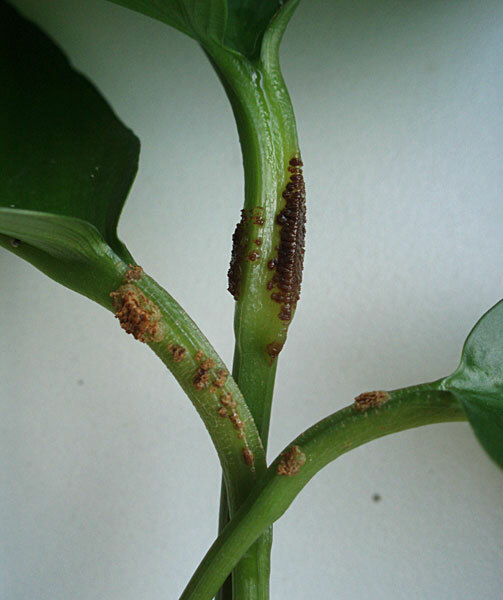 It should be noted that such members of the Arum family as Cryptocoryne, Aglaonema, Piptospatha and Lagenandra being kept together with an infected Anubias plant are not affected by the disease. Besides, in comparison with totally green Anubias plants, those having red leafstalks and rhizomes get afflicted very seldom due to fungicidal properties of anthocyanins creating their colour. Spots on a section of rhizome. The “rhizome rot” is a more malignant disease than the first one, and it is hard to cure it once and for all with the exception of some rare cases. Application of such contact agents and systemic drugs as fludioxonil, copper chloro-oxide, difenoconazole, erythromycin, and different bioprotectors cannot solve the problem completely. Besides, the treatment should be provided only if there are no hydrocoles left in water which can be killed by these drugs. Almost every antibacterial and antifungal drug mentioned above is phytotoxic and not only manages the infection, but also suppresses the plant immunity. It may take the plant a year to make a complete recovery. Meanwhile, the infection may return after a while. Thus it is primarily important to cut off all afflicted tissues during the treatment. Just as in the first case, stronger plants are less vulnerable to the disease than others. Besides I’ve come across such a fungus disease of Anubias plants when there appears a black rash on the plant genicula followed by affliction of the rhizome as in case of the “rhizome rot”. The disease can be managed by means of a prompt (before the release of spores) removal of afflicted leaves. Black rash on a genicula of petioles. To conclude with, I would simply advise the reader to pay the closest attention to the purchased plants sold rather by reliable fanciers or suppliers.